In the early years of EUROCLIO we organized two conferences in Glasgow together with Strathclyde University about competence based learning in history. The onsite learning programme brought the participants to New Lanark, the big factory complex owned by Robert Owen. It was at that time not long ago that I left teaching myself, and I had still vivid memories about teaching about Owen and his social experimentations. I was thrilled to finally visit the spot where it all happened and had a real historical sensation (Huizinga) when I was allowed to hold in my hand the first edition of Owen’s biography with his signature. The beautiful natural location and the good preservation of New Lanark were constantly in my mind while reading David Sekers’ A Lady of Cotton: Hannah Greg, Mistress of Quarry Bank Mill. His description of the location of the Quarry Bank factory in the neighborhood of Manchester made me aware that it must have been a very similar situation to that of Owen’s New Lanark. A Lady of Cotton: Hannah Greg, Mistress of Quarry Bank Mill is an interesting publication, which intertwines gender, religious and moral history all closely related to the vast industrial development of England, and particularly the expansion of Liverpool and Manchester. It tells the story of Hannah Greg, a well-educated and intelligent young woman of Dissenter background. She married Samuel Greg one of the first cotton industrialists. She bore him thirteen children, who almost all lived long lives. The book gives insight in the opportunities Hannah had in the world of Dissenters to have a good education. Among these Protestant Christians, who were separated from the Church of England, was a substantial group of the new factory owners in the Midlands. They build new churches and created intellectual societies, which were sometimes also open for women. Hannah’s parents gave her the opportunity to become well educated, however when she married she entered into a man’s world. Her husband expected her to be a good and dutiful wife. Initially she had difficulties with this position but eventually she accepted her fate and used her knowledge and skills to make sure her many children received modern and high quality education. She and her husband had a pleasing relation, although it was hard for Hannah to accept that her husband owned a property in the West Indies based on slavery. As wife of a factory owner of growing importance she turned her attention to the well-being of the young people (from 6 years old!) who worked in her husband’s cotton mill. She worked to improve the education, health as well as the welfare of the pauper apprentices. She used her knowledge and experience to publish a great number of books and could therefore widely influence her community and many who came into contact with her. David Sekers becomes regularly a bit repetitive. It might be that this is the result of the limited amount of resources he could use, but it is slightly irritating to read a few times the same information. A better editor would have saved him for such repetitions. 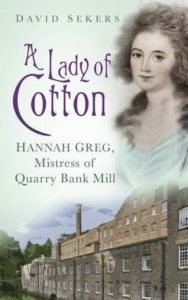 A Lady of Cotton: Hannah Greg, Mistress of Quarry Bank Mill demonstrates flawlessly the discrepancy between high minded philosophy and religious conviction and the reality of everyday reality. The dissenters had lofty ideas about education and equality but if it came to the mills’ workforce they did not (fully) apply to the pauper apprentices. These very young children were necessary for the production, and there was little questioning if such young people should be working instead of going to school. They received education at Quarry Bank, which was indeed exceptional for that time, but it was to become good and well behaved workers. These young workers should not challenge or change their societal position. Hannah’s silence about her slave owning husband also shows how she lived with a double standard and how complex it was to match ideology and practice. The current debate on the role of the Bristol philanthropist and slave trader Edward Colston is another example of such double standard attitude. A Lady of Cotton: Hannah Greg, Mistress of Quarry Bank Mill allows educators to discuss political and religious tolerance, especially in times of war. The book gives insights into the political situation of the Dissenters around 1800. They were already before the Napoleonic Wars observed with suspicion by the leading political powers. However, when they openly showed understanding for the ideals of the French Revolution, the position of Dissenters became really difficult. The book sheds light on the opportunities and limitations around the turn of the Eighteenth and Nineteenth Century for intelligent women like Hannah Greg. It shows that women had more opportunities in that time to become educated than normally is assumed, but as soon as they married their freedom was restricted. David Sekers’ preface to the book contains a short but helpful introduction into the source problem he encountered, when he decided to write about Hannah Greg. He was lucky to be able to use the Greg family archive, but was well aware how one sided that might be. His text helps students to think about the relation of building a narrative, based on truthful facts and still not being able to write a true story. In a time where we are caught in a big debate about facts and opinions, it is good to remind us all that history in the end always will be able to partially disclose the full picture.